you weren’t ready to leave them just yet. Last week I finished reading a story about our country’s Civil War. Andersonville was probably one of the most retched prisoner of war camps during that time. I’m not sure which officers in charge of the camp–Wirz or Winder, were more to blame for the deplorable conditions. In this story we learn of conditions partly from Dr. Stiles who is tired and worn, with more work than he can handle. He felt useless against thousands who were sick and dying. The plot thickens once his spirited daughter takes the train to Andersonville and wonders at the smells in the air, long before she arrives. Violet is shocked and humbled at the sight of any humans living in such conditions, even their enemy. She didn’t just talk about it, Violet did something about it. But how to you raise awareness among the townspeople about conditions in the camp? It was a prison camp for their enemy. The enemy that stole their sons and husbands and beaus from them. Why would they want to help? 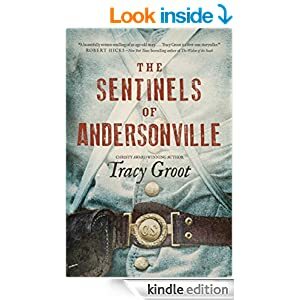 If you enjoy historical fiction filled with danger, romance, and uncommon friendships you will pick up this book and not put it down until you are done. Then you will also be sad like me that the story is over, but its worth it.